The CRM industry is expected to jump beyond US$ 36 Billion in valuation. It entered the life of a business in the 1980s as a Rolodex, migrated to excel sheets, transformed into a single platform digital CRM solution and is now available on wrists. What a journey! As businesses rush to rethink their customer relationship strategies and implement CRM, they often ignore key areas that are the real differentiators. As the saying goes, "Implement in haste, repent at leisure". 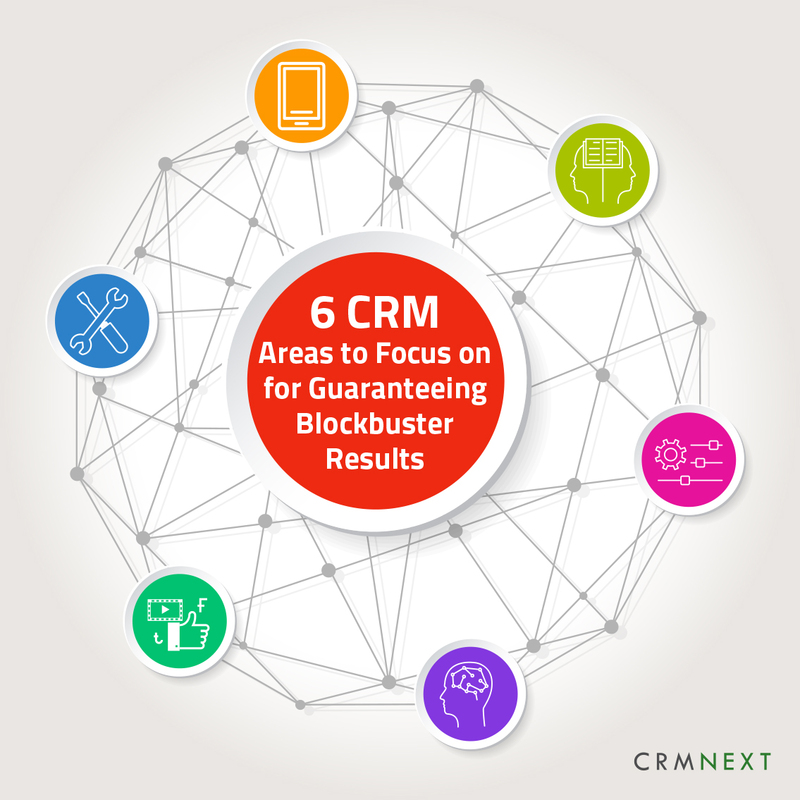 Below are the six key areas in CRM that you need to focus on for guaranteeing results that surpass expectation. You may have the best CRM software in the world, with state of the art features, tools and cutting edge technology. But it will amount to nothing unless you make the CRM platform accessible to your workforce and customers anytime, anywhere and any device. This means making data creation easier, intuitive and fast. It involves enabling teams to prioritize work, appointments, managers to track and improve sales activities on the go; conduct smarter meetings and allow on-demand customer assistance from experts. Inculcating a mobile first philosophy in your CRM undertakings, through mobile touch points likes smartphones, tabs, wearables, sensors etc. will increase credibility for your customers and efficiency for your workforce. Experience without mobility is incomplete. People tend to hate IVR, especially while desperately trying to reach customer service. In this digital age, human voice still counts. Video and social engagement tools in CRM software aids personalized communication on demand. Face to face communication with product experts gives customers a chance to experience in person assistance. Much better than impersonal and automated robotic responses. By connecting people with information through your CRM platform, you create a powerful self-service platform. Customers can thus track relevant products, issue statuses and application progress. Building a robust self-service portal translates into enormous operational savings. Customers can discover relevant solutions, offers and can request manual assistance, if needed. By making them owners of their journey experience, you are building a captive base for your new products or services. How proactively agile is your business processes? That answer will make you aware of long-term growth prospects for your business. A BPM tool, as part of CRM solutions, can significantly accelerate process cycles, resulting into faster customer fulfillment. Creating rules for powerful engines is as simple as dragging and dropping predefined tasks in a visual designer. Focusing on business process management will make you well equipped in this world of instant gratification. Knowledge is power. More so for your customers and workforce. A smart content management system will not only allow easy access through a centralized repository, but can also enable role-based access, faster sharing, data capturing through OCR (Optical Character Recognition) etc. The more robust your document management system is, the faster it will aid in moving processes forward. The onslaught of AI has raised the bar on service. Omni-channel engagement powered by messaging, social, mobility and smart chatbots is delivering delightful service on demand. For this happen, however, you need to ‘master’ your master data management. This will empower you to capture and hear the voice of the customer and execute powerful analytics to measure business performance. These six focus areas will help you to create a well-rounded plan for implementation, adoption and other parameters. You can thus significantly improve customer satisfaction, loyalty and advocacy that boosts revenues and bring in cost efficiencies. Explore the best CRM Blog!